After a hard day at work or play (or both!) you are exhausted. Anticipating a warm greeting by family and pets, imagining turning on the stereo, picking up a book or cracking open a cold beverage, your guard might be down. You get nearer to home and your pace picks up, like a trail horse getting close to its stable…. and just as you are about to reach for the door… YUUUUCK… you are enwrapped in fine, sticky filaments! You flail and spin, desperately picking the silky strands from your face and PRAYING TO GOD (even if you are an agnostic) that one of the big fat spiders that lives in your garden in not somewhere about your head or face. A bad end to your day (and the spider’s, too!). You have just ruined a good four or five hours’ work that the eight-legged engineer has put into making its elaborate web. This is too bad for you too, as plenty of harmful and annoying insects are caught in these traps. So, you`d better be on your guard, especially at night when you are walking down your front walk. If there is no outdoor lighting ( as is the case many a time at my house), you had better take it slow and keep your hand stretched out in front of you as a web detector. 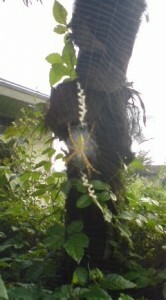 The ironic thing is that some Japanese spiders, especially the big, yellow and round-bodied KOGANE-GUMO, in order to protect their creations from being trampled on or walked through by large creatures, weave clearly visible patterns into their webs. These are called KAKURE-OBI in Japanese, and STABILIMANTIA in English. There is an interesting variety of these patterns and it seems that specialists are still at loss as to their exact function. I had never seen them before coming to Japan, but have heard that they can also be found in England and Australia. Please look for these mysterious designs in any webs you may pass by. Another thing you might notice in this season are the tiny, sand colored sacks, suspended in cobwebs. 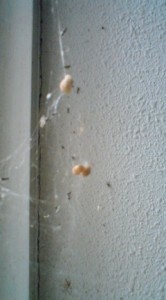 These are the spider`s eggs. 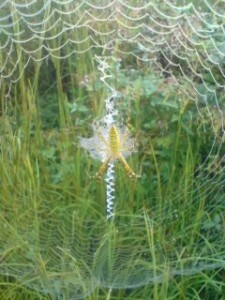 Tsukuba’s spiders are beautiful and abundant. They and their webs are fascinating to look at and photograph. They certainly make you think. They display the most sublime designs found in nature, almost (but not quite) defying the possibility of being the product of random selection- and nature’s most cruel and terrifying face (what can be more horrifying than watching a spider coldly and efficiently dealing with its unfortunate prey?). An interesting cultural note is that in Japan there is a story related to a spider’s web which is very similar to the biblical story of the young David hiding from King Saul ( who is paranoid rage is out to kill him). In that story, Saul does not enter and search the cave in which the future king of Israel is hiding because a large spider’s web is covering the entrance. In the same way, a legend about Minamoto no Yoritomo (1147-1199), the founder of the Kamakura Shogunate, tells how the future warlord in his youth was hiding from his enemies in the hollow of a tree. 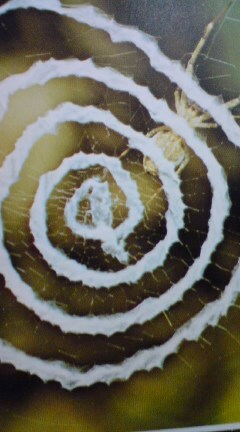 Since the opening was covered with a spider’s web, his pursuers did not search inside and find him, allowing to go on living and eventually change the course of Japanese history. 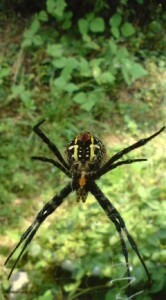 Enjoy Tsukuba’s beautiful spiders, but you don’t want to get TOO CAUGHT UP. Always proceed with caution at night. Leaves Fall Away- Sometimes Revealing the Shrikes`Macabre Handiwork- MOZU NO NIE (鵙の贄)- Tsukuba`s ( and Japan`s) Shrikes- birds with a very curious habit! The webs are so intricate – like lace. But…the spiders is my worst enemy. The recent report on the red is scary. Oh, one more thing – this post reminds me of Charlotte’s Web.